As many readers of this blog know, I have a list of open mics, my Thumbnail Guides to open mics in more than 20 cities around the world. These are the cities I visit as a journalist covering Formula One, and I basically only put on the lists the venues where I have played. Today, though, I just wanted to use the blog to announce a one-day open mic festival in Melbourne, Australia on 28 September, to welcome in the spring (there!). I’m putting this up for two reasons: 1), because someone involved in the festival sent me a link to the Melbourne open mic festival page on Facebook, and I encourage readers to give me their local information, since I visit the cities just once a year, and 2), because, as it turns out, my Melbourne Thumbnail Guide to Open Mics and Jam Sessions happens to be my second most popular list of open mics, behind that of my home city Thumbnail Guide of Paris open mics. This festival looks great. I’d go if I was there, but I’ll be in Paris that weekend…. MELBOURNE, Australia – My worldwide open mic journey began in China in 2008 after the Formula One race in Shanghai, and little did I know that it was a journey that would continue for six more years and cover most of the globe, every continent except Africa (where I once lived and played music in an open mic decades earlier) and Antarctica, and that it would spawn a book, a blog, an album, a documentary film, numerous podcasts, music videos and other multimedia projects. So here is the page devoted to tying together the pieces of the open mic adventure that I have lived in Melbourne, Australia since I first started here in 2009. At each subsequent Formula One race I visit this year, I will add a new such page. Keep posted…. MELBOURNE, Australia – Just when I was getting all excited about experiencing a new open mic in Melbourne last night, just when I was thinking I had another catch to add to my Thumbnail Guide to Melbourne Open Mics, Jam Sessions and other live music, I learned that this most amazing open mic is going to close down at the end of the month after four years of existence. And so it is that I find myself writing an obituary for one of the great open mics I’ve gone to anywhere: Acoustic Cafe, in Melbourne. I remember seeing that this place existed in years past, but I’m not sure why I never managed to get there until last night. Even then, I was lucky to get on the list, as by the time I had called up the list was full. But because the Acoustic Cafe on at 187 Johnston Street in Collingwood has the truly great open mic spirit, Glenda – who runs it along with Ian, the instigator of the Acoustic Cafe – told me to come along and she would try to fit me in. As it turned out, there were some who had put their names on the list and did not show up. I will be eternally grateful, since this was one of the great open mic experiences, as I just said. Located in a very funky little bar with the mic setup at the front window, and with a long corridor leading to a back terrace, the Acoustic Cafe has one of the ingredients that makes for a great open mic in the small size of the room. It is so intimate that everyone kind of has to conform to the attitude of listening to the music more than talking. Another ingredient is the great attitude and approach and openness of Ian and Glenda. Another ingredient is that it attracts some wonderful musicians of all ages, but very clearly it is open to and encouraging of the youngest generation. It has another thing going for it that I have never seen before anywhere: It’s not an open mic with one guitar for people to use, but rather a whole museum of vintage guitars hanging on the walls high above the main room, any of which is there for a musician to ask permission to use, and then use. And not just guitars, but I think I saw a mandolin or two or a bouzouki, although I didn’t really check it out. Oh, and it turns out that if you want to buy one of the guitars, you can do that too. They’re for sale! Another cool thing is that Acoustic Cafe records a video of your performance, and they’ll make a DVD for you if you ask for it. I was so nervous that I don’t think I want to see mine, but I was pleased that I got to play something like five songs in total despite the full list! (My songs: Crazy Lady, Borderline, When You’re Gone Away. And also the cover songs: Cat’s in the Cradle and Year of the Cat.) I liked that aspect of this place too, which is that they did not set the number of songs to a fixed quota, but let you go on or encouraged you to go on depending on the feel of the vibe of the music and the moment in the spectators. There were a number of interesting singer songwriters, and that was the emphasis. Cover songs were in the minority, but not banished. It ranged from a mono-chordal Japanese woman of haunting melodies and lyrics to a guy with an eye patch – he said it was the result of a battle between him and a contact lens, and he lost – to a boppy Chilean and a local “many-friends-in-the-crowd” songstress singing (cool) songs about her friends…. 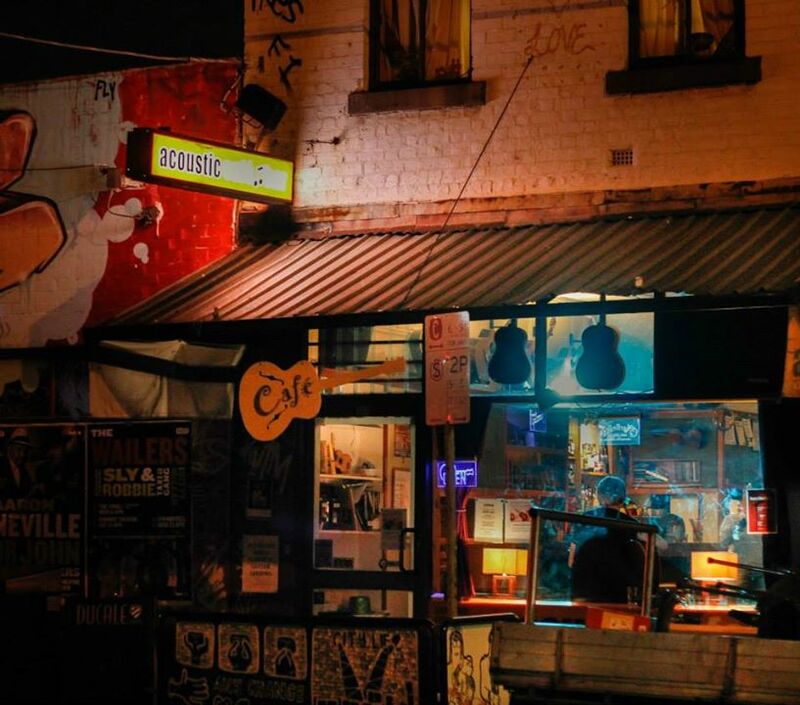 So there are going to be two more open mics at the Acoustic Cafe before it closes at the end of March, on the next two Thursdays starting at 7:30 PM, and if you are in Melbourne, I cannot recommend highly enough that you attend, whether it is to play or to listen, or both. Glenda tells me that they will not be seeking to start up a new open mic, but I had some sixth sense that told me that I would not be surprised to see that she and Ian end up finding a new location – but can it be as good as this funky place? Well, if anyone can make a success of any location, I suspect they could…. Because it is the end of the line for the Acoustic Cafe I decided to get a few bits of atmosphere in my videos of the place, and not just music. So check out the atmosphere videos – I loved how the cash register had a number of guitar picks sitting on it…. Great Australian Experience at the Great Britain Hotel Pub or Whatever…. MELBOURNE, Australia – So here I am at the nighttime of the second day of my time in Melbourne, on a clock time of I don’t know what, since there is a 10-hour difference to my homeland of Paris. But I do know that I have now actually taken part in TWO open mics. And I do know that both experiences were astounding. OK, that’s hyperbole. Wait until I write a bit about tonight’s experience tomorrow. For the moment, I’m writing about yesterday’s experience today. If you find that confusing, imagine how I feel going through all the time differences…. Anyway… last night it was another visit to the mainstay Melbourne open mic of the Great Britain Hotel and/or pub. I say and/or because as far as I can see this place is not a hotel but only a pub. Still, there may well be a hotel upstairs – but if there is, I wouldn’t want to go there. Having said that, the open mic is well worth it. It’s a well organized one with a great little stage, a nice sound system, excellent lighting, and an all together cool experience. And it has been going for years. I think this was my third or fourth year playing here, and each time I have actually had different experience. So anything I say about it today, will probably be out of date tomorrow…. But after last year I thought it had taken a little turn for the less crowded and interesting, this year suddenly there was a nice sized audience and a number of very cool and interesting musicians. There were also about four or five comics, which I don’t think I had ever seen even one of before. So expect anything at the Great Britain open mic in Great Melbourne! In all my four years visiting open mics and writing about the experience, I don’t think I have ever had an anecdote to tell that says so much about the ambience and general coolness of the open mic as the following one. Last night in my last night in Melbourne, I returned once again – for the third or fourth time – to the great and intimate Empress Hotel open mic on Nicholson street in North Fitzroy. The hotel is a well known music venue, and Robin and Frank have been running this open mic on Tuesdays for around six years, although an open mic existed before that. It is an excellent venue with a warms stage, hot lighting, back outdoor terrace, laid-back feel, and spectators who respect the other musicians, listening and generally staying to listen after their own sets. I recounted on this blog last year how I was in such a state of nervous spent-ness just before leaving for my flight to Malaysia but also needing to interview people for my series of Podcasts, that I walked out of the open mic and went off to the airport having left a great guitar tuning device that I had just bought, AND the huge copy of the Steve Jobs biography that had recently come out. I was halfway through the Jobs book, and loving it, and I had just bought the tuner. So imagine how upset I was. Well. After posting on the blog about leaving my belongings behind, Robin wrote me to say that they had recuperated the tuner and the book and would keep them for me. For me, this was the end of the story. I completely forgot about the tuner and the book, and yesterday I returned to the open mic a year later without warning Robin and Frank (who operates the soundboard so deftly) that I was returning again this year to play some more music and hear more music at their great open mic. I got there early to get an early spot on the list in order to get out earlier this year to catch the same flight with less stress…. And when Robin and Frank arrived, Robin marched right up to me and gave me the book and tuner! The battery in the tuner is fully charged, as it was when I left it last year, and the book was in the same condition as well. This was EXCEPTIONAL! It says all you need to know about this great open mic. By the way, I here include my first video of me singing my song, “If I Only Had You,” because it was a song that until now I was not supposed to sing as my own. I had written it for someone else. But it has now been months since I gave it to them, and I’ve heard nothing back for many months. So I have decided to re-appropriate the song for myself. I was filmed last night by my friend Emily Brown, who used to run the great All Nations U-Bar open mic, and as it turned out, she liked the song and said SHE might do something with it! So we’ll see if it has a life beyond me after all. The Empress Hotel certainly will have! It was the first time I had been in the heart of this Brunswick area of Melbourne, and when I took the tram from near my hotel on Spencer Street downtown out to Brunswick Road, I thought I had arrived at the edge of the earth. The houses in this area look like they are sitting on the Bayou in the deep south of the U.S., and the store and pub facades look like cowboy movie set facades. 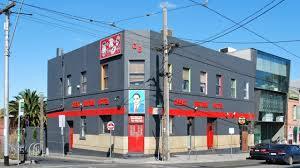 But I was assured when I entered the large, cavernous and cool Cornish Arms pub that I had arrived in the hip and cool hot part of town in Melbourne. OK, OK, I know my observations of the way things look could get me grilled somewhere, perhaps fed to the alligators. But I would say the same thing of certain parts of of my home town of Toronto – or similar reflections on places like Jerhico in Oxford…. But anyway…. The Cornish Arms was another of these very cool Australian pubs with a fabulously cool stage with lighting and a good sound system and practically a proscenium arch. I would love to know the history of why so many of these neighborhood pubs have such cool stages built into them. Perhaps it’s from when the prisoners were required to make their own entertainment before the days of television and radio…. The place was great too for its wide open space, terrace, vast bar and decent meals available on the menu. So I ate dinner, signed up right at 7:30, got a slot for 10:15 – although I think I was probably within the first three or four to arrive, and it’s a rush for the sign-up – and did my songs. It’s a 15-minutes slot, which comes to three songs. My only criticism of this open mic, really, though, was that like that of the Great Britain pub last Wednesday, it was another of those situations where people came, sang and left. I did not really get a sense of a scene, a happening, or support of fellow musicians the way I do in so many of the best open mics, and in so many in my “home” town of Paris. But I know those have existed in Australia – like with Emily Brown’s open mic in the past at the All Nations U-Bar, or a little at the Arthouse, and definitely at the Empress Hotel – and apparently it exists at the Artcafé, but I missed that one. From that point of view, my evening was once again saved by the amazing singer Aarti, who did this great a cappella song that I videoed, and with whom I spoke much of the evening. I had met her at the Great Britain last week, remember. But this time you can see the image of the video much better, thanks to the great lighting. And the sound is better too – so check it out…. Before embarking on my fifth worldwide tour of open mics and jam sessions last week, I announced on this site that one of my projects for the year would be to expand my popular “Thumbnail Guide to Paris Open Mics,” by adding making a collection of such pages, by adding a new page for each of the 19 other countries I visit around the world this year. Today I have taken the first step, by putting up my guide to Melbourne, Australia open mics. I have also rearranged the blog to simplify and make sense of the new series of thumbnail guides. The Paris guide and the Melbourne guide and all future guides will be located in a new menu item at the top of the blog page, called “Worldwide Open Mic Thumbnail Guide,” which has a page with a full explanation of the project. As I explain, the new pages will not be as exhaustive as the Paris page, since I live in Paris. But I hope they will help travellers and locals, and I also ask for locals and travellers to provide me with any open mics they think should be listed, by sending a word in the comments area on the relevant page, and I will add it to the list.